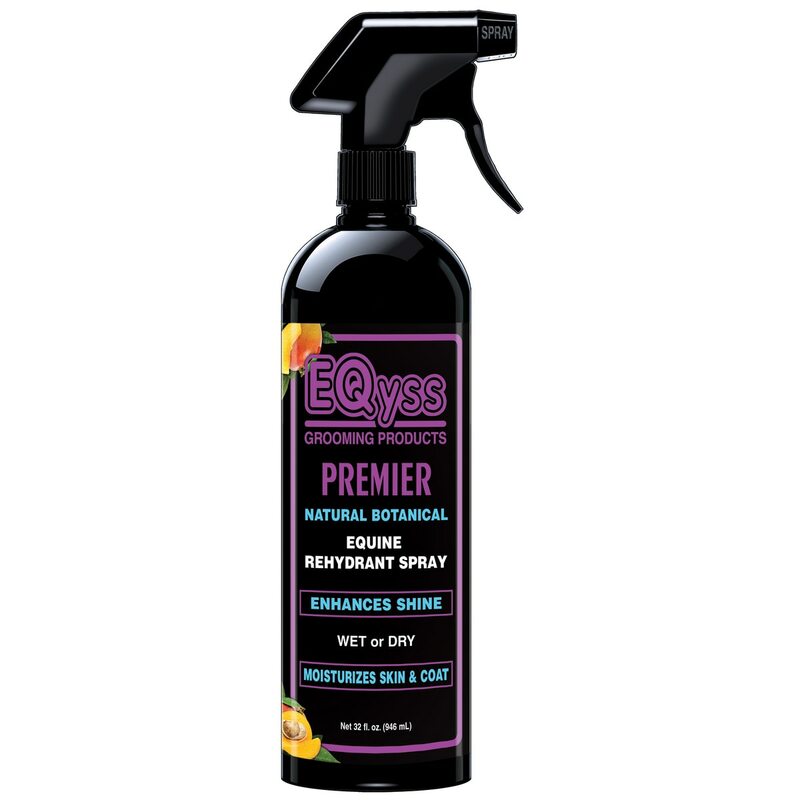 Eqyss Premier Rehydrant Spray is rated 4.7 out of 5 by 39. Rated 5 out of 5 by Mustang from Smells Fantastic I actually mix this product with rubbing alcohol and I use it all over my horses back girth and neck area after I ride. The alcohol helps dry off the sweaty places and this product just adds a nice shine and great smell! Rated 5 out of 5 by AnotherTwoLegger from Excellent body spray, even awesome for dogs! I love this body spray, especially during shedding season and in the winter when they need that extra moisture boost. True to label, it does not make their coat slippery and I've never had a problem using on the saddle or girth areas. As an extra plus, it works fantastically for dogs in the winter to keep static down. I have a husky who gets very static-y in the winter, and if I mist his coat lightly he's good for 2-3 days. Smells very nice, too. Rated 5 out of 5 by Rosalie from A healthy alternative to show sheen I've used this product for years - smells amazing and makes coats healthy and shiny. Big fan. Rated 5 out of 5 by Pitsy from Great Product I love this moisturizer it smells great and it works even better. I spray in on my mares mane and it helps it lay down flat. I spray it all over her body and it keeps her hair and skin nice and moisturized. Rated 5 out of 5 by SpyroandMichelle from Great product! I've always loved this rehydrant spray! Works great, smells great and I feel like I'm doing something good for my horse's coat. I like that it doesn't have any silicone so I can use on his saddle and girth area without worries. I wish the sprayer itself was more durable and leaked less. Rated 5 out of 5 by cc3833 from My favorite body spray I've tried various body sprays on my horse and this one is my favorite. It smells great (everyone at the barn says how nice he smells... and they always know when he is being groomed lol!) This spray keeps my horse's skin from getting dull and flaky in the winter months. I do get him body clipped and this spray definitely helps. It isn't a magic bottle, you do need to put in regular grooming but this spray helps maintain his shine longer than others and has him smelling nicer too. With regular grooming this product lasts about 2-4 months. Rated 4 out of 5 by Kate1234 from Smells fantastic! I used to use this brand several years ago and had forgotten about it. This spray works great on my horses dry skin(especially the top of rump). It smells awesome! The only downside is it's a bit pricey and the sprayer broke. Rated 5 out of 5 by Anevans from Helps with dry skin! I bought this to help with my horses itching due to dry skin. It has helped so much. They are not scratching anymore and their hair has a nice shinny look to it! Rated 5 out of 5 by Minimuffin from It really works! I noticed that my pony had some dry skin and dandruff after the dry winter months, so I decided to give this a try. I noticed an improvement in her skin and coat condition almost immediately. Now she is dandruff free and has a shiny, healthy coat! It smells great, too- worth the price.